Price is for 1 cable. 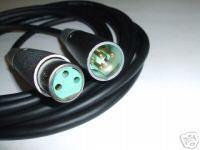 XLR-Connector: Genuine USA-made goldplated QGP 322/323 XLR connectors male/female from Switchcraft. Soldering job: done in Swiss labarotory from Gotham Audio (gotham.ch) by educated staff. Schum cable clip included.Cables are ROhS Compliant. Starquadwiring to receive a 130 dB noise rejection.